Summit magazines lead in 12 categories, including young women, fashion, celebrity, men’s luxury, and men’s lifestyle. 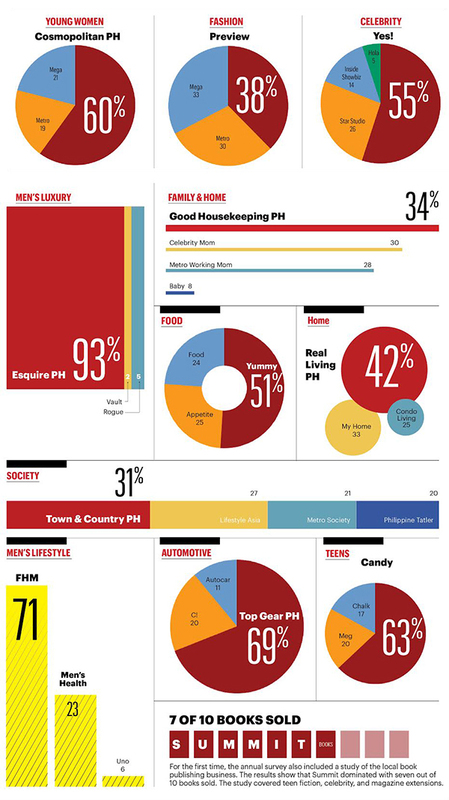 Summit Media gained market share and strengthened its lead in key categories of the Philippine magazine industry, according to the 2014 TNS Newsstand Survey. Conducted in 350 outlets nationwide from October 1 to 31, the study indicated that Summit cornered 57% of magazine copies sold, a significant growth from 49% in the 2013 survey. It also showed that Summit magazines continued to lead in 12 categories; namely, young women, fashion, celebrity, men’s luxury, men’s lifestyle, home, family and home, teens, parenting, automotive, society, and food. The 2014 TNS Newsstand Survey covered 350 outlets in key cities nationwide: 190 in NCR, 50 in balance Luzon, 70 in Visayas, and 40 in Mindanao. It was conducted from October 1 to 31. To estimate market share, the respondents were asked: "How many copies of the following magazines did you sell in the last 30 days?" For the first time, the annual survey also included a study of the local book publishing business. The results show that Summit dominated with seven out of 10 books sold. The study covered teen fiction, celebrity, and magazine extensions. TNS Philippines is the leading customized marketing research company in the country and an affiliate of TNS Global, one of the leading market information groups in the world.